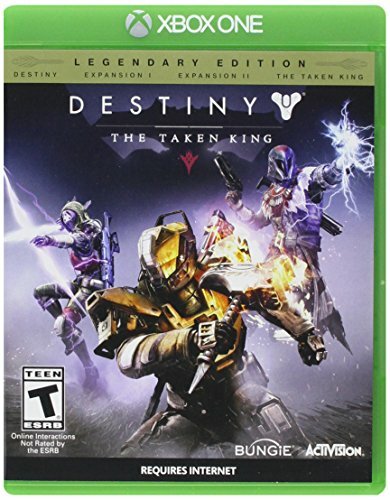 Destiny – The Taken King – Striding into an MMORPG — GamingWithSwag.com - Dads By Day, Gamers By Night. I am the leader in the middle. Chris is the one not pointing his gun and thinking about how to add more yellow to his outfit. Chris and I decided to check out an MMORPG despite warnings that it is folly. This is despite fearful omens that our addictive gamer and collector personalities could be swept away into a game that can devour all of our free time. A genre that often requires multi-hour adventures which is to some degree the antithesis of much of what this site is built around which is life as busy adults struggling to fit gaming into their schedule. Neither of us has much experience in this world. I played World of Warcraft once and literally fell asleep at the keyboard harvesting weeds or something. Both of us love some 60 hour plus RPG titles like Fallout, Skyrim, and Mass Effect but never waded into the murky depths of the Multiplayer worlds of a title like Destiny. Our closest foray together would likely be playing Diablo II in college trying to battle the demons of hell for some sweet Legendary loot. So we will have a recurring series on our adventures, how we succeed or fail, and whether or not we can suggest this course of action to others. I know what you are thinking, “Dean, isn’t this game months old and shouldn’t you pick a cutting edge game as a website fighting for attention and relevance?” The answer is probably, but we are cheap and wanted to get a well received title that worked out its bugs with expansions for less than 40 bucks. We also think the game is less relevant to the greater questions about an MMORPG as busy working dads. Is there economy to someone just having one game, that serves to scratch a social itch while letting them game on without churning through expensive new releases every few months? Can the game be enjoyed when we can’t possibly commit to extremely long raids for some of the finest loot? I imagine most of these answers could apply to other games within this genre and I would bet that much of our audience also fears the MMORPG who live within similar constraints as we do. We will go boldly where literally thousands have gone before, but hopefully you didn’t read any of their stuff and will enjoy our foolish gambit over the next few weeks/months. Our copies arrive Tuesday and we plan to let them download Tuesday night (apparently it takes awhile to load up all the updates as late adopters) and then pick our characters for our launch on Wednesday. Hopefully, I don’t pick a terrible character since you and I will be stuck with them for awhile. If you want to play along, pick up a copy and maybe we will bond while picking clean the bones of our enemies.